The Russian Central Bank has revoked the license of several large banks as part of what it says is a fight against corruption and a shadow economy. Banking industry experts are worried that the Central Bank’s efforts to clean up Russia’s shadow economy could turn into a banking crisis if investors’ fears spark a mass withdraw savings from the banks. The liquidity crisis of June 2004 affected medium and small banks. Payments between them practically ceased. Interest rates on interbank loans were off the scales, sometimes reaching 120 percent, while the day-to-day rate was 1 to 2 percent. An outflow of individual’s deposits and legal entities of the Russian banks occurred. The crisis was triggered by the revocation of licenses in two medium-size banks by capital, private commercial banks, and was part of the general instability in the interbank market. The Bank of Russia recently revoked the license of Master Bank - one of the largest Russian retail banks by assets (80.87 billion rublesб $2.4 billion). According to the Central Bank, the Bank was involved in the maintenance of a shadow economy, and the Central Bank said it was clearing the banking sector from doubtful players. 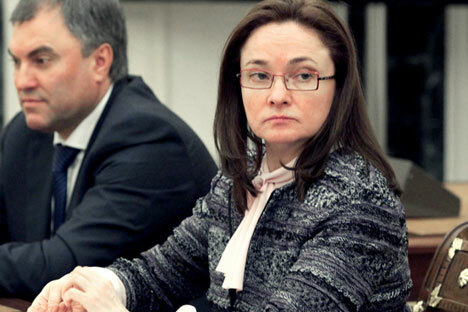 Elvira Nabiullina, the governor of the Bank of Russia took office in mid-summer. During her tenure, 22 banks have lost their licenses, including two large ones. This has seriously disturbed the market participants, and her recent statement that the Master Bank is not alone, sewed fears among bankers and hyped their nervousness. An unofficial "black list" of banks has already appeared in the Internet. The Moscow Interbank Currency Association even published a letter in which it expressed fears that an interbank market collapse may occur, similar to 2004, and asked the Central Bank to weigh it actions carefully. Master Bank is not the first of the major players who have fallen under the hot hand of the Central Bank. Back in September, the license was revoked from the bank Pushkino, and it was declared bankrupt. Now, both banks have a lot of insurance payments. According to Master Bank - 30 billion rubles ($902 million), and according to Pushkino - 20 billion rubles ($601 million). The general size of the Fund of Deposit Insurance Agency is 238.7 billion rubles ($7.2 billion) as of the end of September. Investors fear the DIA funds will be enough to cover all of the insured events, taking into account the possibility of bankruptcy before the end of the year. According to the CEO of the National Rating Agency Viktor Chetveriko, the DIA resources will be enough for any possible bank failures. By clearing the market of the so-called "questionable banks," the Central Bank is fighting corruption and tax evasion, said Chris Weafer, the founder and senior partner at Macro Advisory. "Capital outflow is a big problem for Russia. Since mid-2008, it amounted to about $400 billion. A quarter of these funds accounted for individual operations and companies simply exporting cash. The government has repeatedly stated that it intends to eliminate hundreds of such pocket banks serving the interests of business groups or individual beneficiaries, but the process was too slow," Weafer said. Russia still has far too many banks and many of these are not more than the so-called pocket-banks for business groups or individuals. There are approximately 900 licensed banks in Russia today, but the top 50 banks control 80 percent of assets and the top 100 control more than 90 percent. It was easy to get a banking license in the 1990s in Russia. For many years $100,000 of capital was the requirement, so hundreds of the pocket banks opened. Market participants say that the Central Bank is trying to prevent panic and urged bankers to work under the law and made it clear, so there will be no problems for the players who will abide by the rules. "The Bank of Russia now has a policy of consistently cleaning the banking sector. In addition, it is important to consider that in the team of the Central Bank has changed and it is a kind of a demonstration performance, to demonstrate the effectiveness," said a source in one of the largest retail banks in Russian. "This situation will not lead to a banking crisis: the system is quite stable. Individual banks will leave the market. The Central Bank has signaled that it will continue to pursue a policy of withdrawal from the market of banks substituted by a suspicious transaction. It is not a fact that it will be big banks,” said Mikhail Kuzmin, an analyst of the financial sector t Investcafe Independent. Mostly, people say that the global sweep of the Russian banking system will strengthen the government sector. Current market situation will provoke people to shift their funds to large banks, often government ones, said Kuzmin. The first signs of this trend can already be observed. As calculated in the National Rating Agency, in October in the banks that are not included in the top 10 by assets, the outflow of deposits of individuals amounted to 25 to 46 percent. These funds are awarded to 10 of the largest players in particular, the share of the Sberbank in October was 40 percent (50 billion rubles, or $1.5 billion) growth, VTB 24 (retail affiliated company of VTB) was 21 percent (25 billion rubles, or $750 million).